The Folland Gnat was a reactionary byproduct of the sophisticated, bigger, faster, heavier and powerful mantra that dominated the aircraft industry in the beginning of the jet age. W.E.W. "Teddy" Petter, the designer of the Lightning, rebelled against that trend and designed a cheap lighter fighter jet that could defend UK airspace. Originally, the Gnat was to be similar to the Me-163 Komet, a little rocket point defense fighter. That idea didn’t work out as rocket powered fighters proved to be an aviation dead end so Teddy opted for conventional jet engines instead which were becoming more compact at the time. Work progressed on the lightweight fighter till 1957.when most UK aviation projects died a quick death after the infamously naive Defense White Paper proclaimed manned aircraft obsolete and missiles the wave of the future. Luckily for Folland, both the RAF and the Indian AF found what they were looking for in the Gnat. The RAF wanted a simple jet trainer that could train their “obsolete” pilots a lot cheaper than trainer versions of the complex and expensive jets they were flying in service. The Indian government wanted to build up their aviation industry on the cheap by acquiring the license to build the Gnat for their AF. The two seat T1 Gnat became famous as the mount of various RAF acrobatic teams, but more famously with the Red Arrows who flew them till 1979 when they were replaced by the BAE Hawk. In Indian hands, the Gnat/Ajeet was known as the Sabre Killer in the various Indo/Pakistani wars and proved to be a tough foe for the American trained Pakistani pilots due to its amazing agility and small size—No22 Squadron of the IAF was named the Sabre Slayers. They served with distinction till they were replaced by Indian made Mig-21s in the late 70s. However, as one realizes, the small size of the Gnat/Ajeet fighter limited its payload and range. Finland was another user of the Gnat F1, buying 12 copies for its air force. 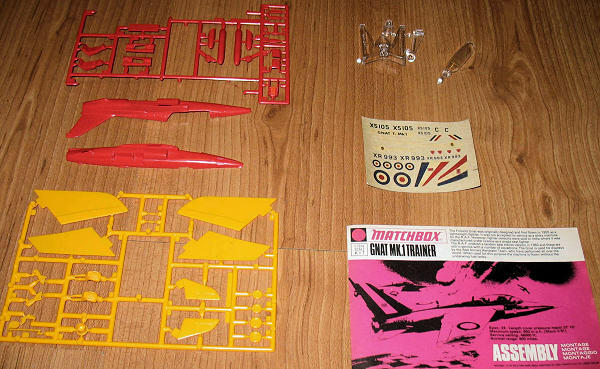 The Matchbox Gnat T1 kit consists of two colored spures (red and yellow orange) for a total of 35 parts and one clear part with the Matchbox Stand. The Matchbox trencher is evident here with the deep (for 1/72 scale) recessed panel lines. One thing that should be noted is that they did not have the sophisticated CAD/CAM and metallurgical techniques of today so these lines were probably as fine as they could get. 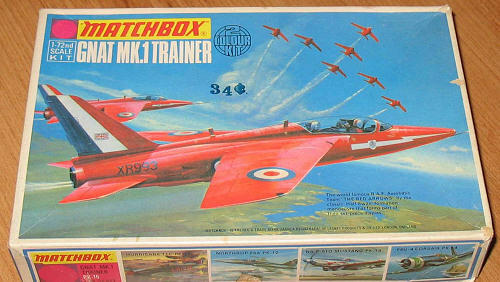 The Matchbox kit differs from its Airfix cousin as it is equipped with wing tanks. The decals for this kit are too far gone to be ever used on a model which is not surprising as this particular example was manufactured the same time as I built its “brother” some nearly 30 years (!) ago. Matchbox kits were designed in an era where modeling was made to be fun. Stuff like details and accurate shapes were nice to haves, but not all that important to the fun side of model building. Actually, I do not intend to build this model as tempting as it is. As far as I’m concerned, this is my only concession to “collecting.” When I get around to it, I hope to build the Airfix version of this plane with super duper magnification goggles—this kit is very small. The Gnat T1 has been well served in 1/72 scale (probably because both mainstream kits came from English kit makers) with the Airfix still available (for how long?) and fairly inexpensive. The only option available in 1/48 scale is the limited run Aeroclub kit.